Body lift surgery is a complex operation that requires a lot of information to be processed and considered. There are 3 main points that people interested in this procedure should keep in mind especially that this involved both a major physical and psychological recovery period. Make sure you are doing the body lift surgery for yourself and for the right reasons and that you have realistic expectations. Be aware that an improvement in the problem area may not necessarily translate to an overall improvement in your life or home situation. You are bound to be disappointed with results of body lift surgery if your motivation is not intrinsic. Timing of your body lift surgery is crucial. Generally, it is not a good idea to have body lift surgery done during or immediately after a stressful period in your life e.g. divorce or death of a loved one. The additional stress of body lift surgery will undoubtedly be more challenging to deal with if your emotional reserves are already exhausted. Take note that an improvement in your physical appearance will not necessarily translate to an improvement in your life situation. Lastly, keep in mind the end results as you go through the sometimes tough, emotional times after your body lift surgery. If possible speak to patients who have undergone body lift surgery and ask them about the toughest times of their recovery period. Any practical hints these patients can provide may be very helpful to you. Make sure you have a strong support system in place at home (with several people if possible) who have the time and patience to take care of you. Arrange for professional nursing if there is any doubt regarding the availability and/or stamina of your caretakers. It’s a good thing to distract your mind with things of interest such as books, games and movies etc. More importantly, expect less of yourself. Don’t go back to work, school or chores too early. Let others take care of you for a change as this is your time for rest and recreation. 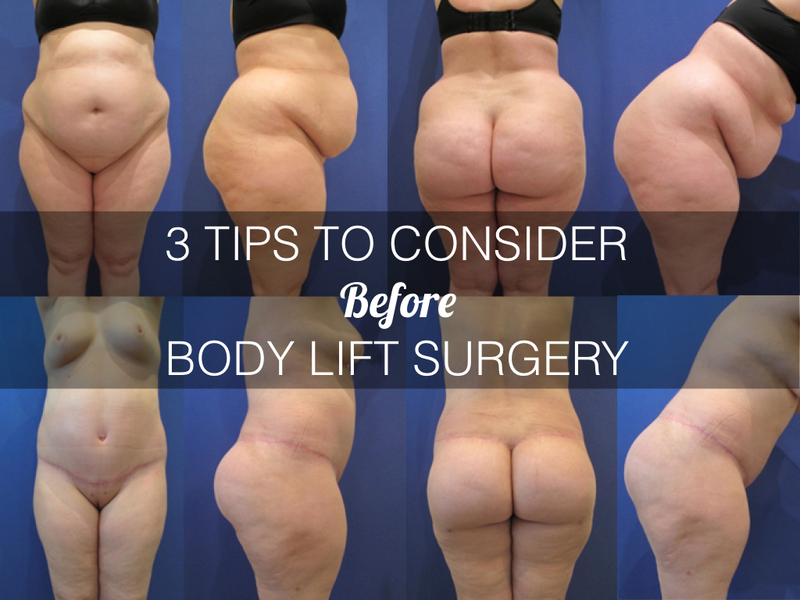 Make sure you are aware of the potential risks and complications that may arise from body lift surgery and how to reach your plastic surgeon if necessary. Pick your plastic surgeon carefully (an experienced licensed plastic surgeon) and trust in their advice. Keep in close communication with your plastic surgeon and do not hesitate to communicate questions or concerns that you may have. It is essential to see your plastic surgeon’s before and after body lift surgery photos. Make sure these patients are weight loss patients and try to find before and after photos of patients who look like you. Furthermore, be patient with the healing process and understand that it will take several weeks to months to return back to normal again (it may take many up to 3 t0 6 months to see the end results of your body lift surgery). Resume all medications that you were using preoperatively when cleared by your plastic surgeon and stop the use of narcotics and sedatives. Question: What are your 3 most important concerns regarding body lift surgery? You can leave a Comment below or Share this post with family and friends. My main concerns would be scarring (that’s my huge #1! ), downtime and how the surgery will hold up as I naturally age. Still, it would be life changing for many people! I would like to know if you do the inner thigh..